Organizations are made up of two things, people and everything else. Digital transformation is led by people—there are hundreds of enterprises across the globe achieving game-changing innovation and transformation leveraging a scalable, robust intelligent Digital Workforce from Blue Prism. We call these customers, partners and thought leaders—Digital Visionaries. In two Iconic cities, New York and London we saw over 2,400 attendees engaged in a symphony of information, insights and innovation. Incredible insights were shared by the world’s foremost Robotic Process Automation (RPA) and AI customers, partners, and thought leaders, including organizations such as ATB Financial, Constellation Brands, Fannie Mae, Fortress Investment, Johnson & Johnson, Lincoln Financial Group, Pfizer, TD Bank Group, Schneider, along with partners Accenture, Deloitte, EY, KPMG and Appian. These are just a few names we can highlight from Blue Prism World 2018 in New York. 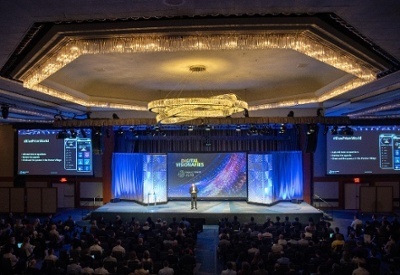 The nature of the discussions, both on stage and during networking breaks (and the fact that 1,000+ registrants were waitlisted to attend), made it dramatically clear that RPA’s value proposition has evolved far beyond just a tactical cost reducer to a real driver of strategic business value. RPA is about job enrichment. It’s about removing the routine and repetitive tasks off an employee’s plate. It’s about enabling them to focus on creativity, ingenuity and driving engagements. Customers showcased the power of a Digital Workforce, one that extends RPA capabilities by enabling artificial intelligence (AI) and cognitive services helping enterprise customers drive innovation—making them more than just software robots. Blue Prism CTO and co-founder David Moss spoke to our vision for building out intelligent digital workers which can augment, support and assist their human colleagues to deliver tangible business benefits through intelligent automation skills. We’ve implemented RPA across multiple business lines. Start with RPA and make it your foundation. Expand to AI and machine learning and build out a center of enablement. Digital visionary and customer Olympia Baldrich, VP of Innovative Automation and Banking Services at TD Canada Trust shared that her company’s initial reason for using Blue Prism was to reduce the cost of operations to make more money available to invest in other parts of the bank. Over the course of TD’s 17-month to date journey—with digital workers automating several mission critical processes—the bank’s thoughts around the value a digital workforce can deliver has progressed considerably. It now has four measures. While cost reduction is one of them, the other three are highly strategic: top line impact, reduced risk, and enhanced customer experience. All these digital visionaries heavily emphasized the strategic value Blue Prism digital workers are delivering in support of the enterprises business goals. Blue Prism World New York closed with a fascinating keynote presented by Deborah Kops, the managing principal of Sourcing Change and U.S. chairman and Board member of Antuit. She continued the discussion on value to be gained from a digital workforce. But she did so in a fiery call to action for the RPA industry and organizations leveraging the software. Her take? We spend a lot of time talking about the tools, but what we really want is digital transformation. Tools alone don’t transform, but are rather part of an ecosystem of change. And to change and transform, enterprises should consider embracing five key strategies: redefine the work; reimagine who the workforce is; rethink what the workplace is, and get rid of the brick and mortar; break old paradigms and mandate digital fitness; and, cease binary thinking and sate to embrace multivariate decision making. Be sure to access our new eBook from Blue Prism World NYC to experience more from this event, and feel free to connect with me directly on Twitter @ShailKhiyara.